How can manufacturing organizations re-imagine their businesses, starting with the digital core, and continuing into the initial design and planning of their products, before extending up through manufacturing and an increasingly interconnected extended supply chain? 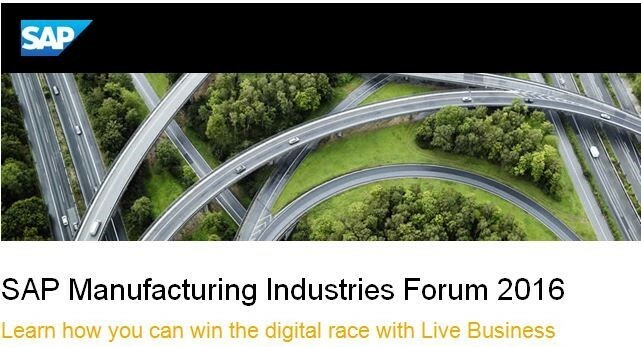 Find out at the SAP Manufacturing Industries Forum 2016 on June 14–15 in Lombard, Illinois! At the event, keynote speaker Alan Cseresznyak, senior vice president of administration for Toyota Material Handling USA and CIO of Toyota Material Handling North America, will share details on the company’s current success and plans for digital transformation. Finally, don’t miss this opportunity to hear Hans Thalbauer, general manager of extended supply chain at SAP, discuss how digitization is reinventing the world economy and creating new opportunities. Check out this infographic now to learn more, and make sure to register today for the only SAP event designed for manufacturers. It’s a Free Event – so why not?